I’m no stranger to Linux. I’ve run numerous distributions since about 1995, even venturing into BSD territory, running FreeBSD and some other Berkeley variants. I’ve also used Linux quite a bit in my professional life for servers. However, I’ve never made the jump to using it as my primary desktop operating system at home; it’s always been a novelty to play with and never a desktop workhorse that I would use to actually get things done. Linux Mint is a Linux distribution that has become more popular recently. It’s based on the venerable Ubuntu distribution and appears to be taking some market share from Ubuntu. Ubuntu in my opinion went off the tracks with its migration to the Unity desktop. For the first time recently I hit a brick wall trying to install the latest Ubuntu within a virtual machine. While Ubuntu was quite polished and arguably had the best usability in the Linux world, I still felt that I was often fighting the operating system to make it work. Linux Mint seems to have taken care of those issues. Last night I made the plunge and partitioned off some space on my hard disk and installed it so I could dual boot between Windows and Linux. The installation went extremely well and within two hours I was able to browse the web, play videos and hear sound, send email, work on Kicad schematics, compile Arduino code, open Excel and Word docs, do my banking with the same program I used on Windows, and I had amateur radio logging and digital programs installed. The only speed bump was getting my wireless working. I was able to fix that in five minutes after Googling and finding one command line to run. On previous distributions, items like this would take hours to resolve and there would be several of them to deal with. For the first time I feel I have something equivalent to what I had on Windows, and it doesn’t look goofy and didn’t require days of tweaking with arcane command line syntax to make it acceptable. The browser actually renders things like they look on Windows. You install a program and it actually appears in the menu. Quite simply, Linux Mint isn’t a compromise like previous desktop installations. I’ve often complained about the state of amateur radio open source software. 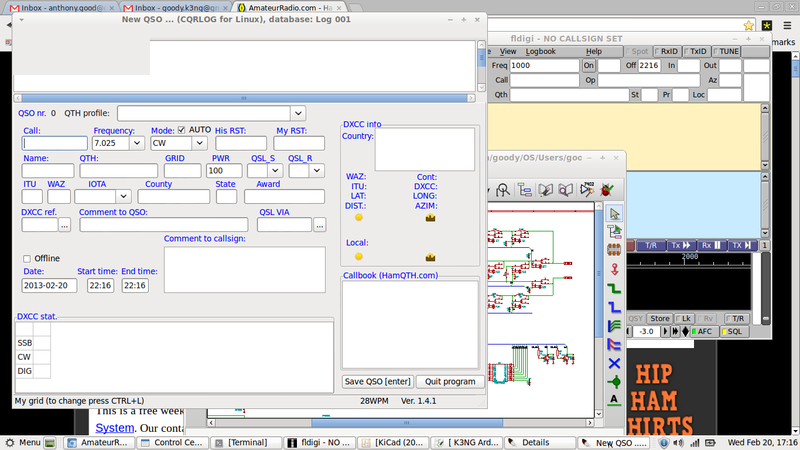 I stand by my previous statements as I think we still don’t have a suite of amateur radio open source software that compares with offerings in Windows, mainly in the areas of logging and contest programs. However, CQRLog has evolved quite a bit and I’ve decided to take a more minimalist approach and see if I can make it work. I still think Ham Radio Deluxe is the gold standard, but lately I’ve become annoyed with its bloat and the commercialization and marketing of it. I’m still keeping my Windows partition, mainly to run one particular contest program and store my documents (which I access from Linux), but I may eventually run Virtual Box on Linux and have a small Windows installation virtualized to run the contest program rather than booting back into Linux. Will this be the time I finally run my shack on Linux? I hope. Actually I would argue that CQRlog is the _better_ logging program than HRD. Granted, HRD and the other programs that come with it are more flashy, more shiny etc. but in terms of functionality? Nope, sorry. To this day the HRD developers haven’t managed to mask the password field in the LoTW dialog. Great. Speaking of LoTW. When you download your updates in HRD, it shows you the number of contacts in the update, that’s it. CQRlog shows you the new ones in the window so you immediately see who confirmed your QSO. DX Cluster: HRD is not capable (at least it never worked for me) to properly filter by mode. In CQRlog I can just say I only want CW spots and it works. I click on a spot and the info gets immediately transferred into the new QSO window. It’s possible in HRD but with extra steps. I’m a member of both NAQCC and SKCC. I want to know ideally when I start a QSO if that person is also a member of either club. Guess what, CQRlog tells me that, as well as if that person is using LoTW for example. I can search for past QSOs with members or I can do all kinds of things with the data as CQRlog uses Mysql as the backend per default (you can configure that in HRD with some hoops) and I can mangle my data as I want. The MySQL database HRD creates is a horrible database design. With that, I’m also able to have the database on my server instead of my workstation which makes it possible to work from different PCs (workstation on the desk or laptop in the backyard for backyardexpeditions). Did I mention that the use of hamlib is just so much better or that Fldigi (which integrates well with CQRlog) start so much quicker and provide more flexibility? How about remote control? No problem through network sockets. Fldigi is the gold standard for digital modes, DM780 is nice and shiny and flashy, but feature wise? No contest. Now what we need for sure would be a N1MM replacement. I tried Xlog in combination with eepKeyer last weekend in the DX CW contest, but not quite a match. I’m going to give CQRLog a shot. Like I mentioned, it’s come a long way since I last looked at it. It’s looking like a viable replacement for HRD for me. I agree 110% on an N1MM replacement, in particular an open source one. For now I’m attempting to run it in Virtualbox in a Windows XP virtual machine. I installed Virtualbox this evening and it’s working great. I’m really enjoying Linux Mint, so much that I shrunk my Windows partition more today and expanded the Linux partition. If you do not need in the scoring contest, try tucnak as small replacement for the N1MM. http://tucnak.nagano.cz/wiki/HF_contest_setup . For V/UHF contest tucnak no compromise. GL! Dan, this program looks neat! I will try this out. Im looking to update mysql database with hrd and cqrlog how do i change the data values so they are both the same ie so both programs will see the logs from each other, has anyone done it ?? I haven’t done it. I think HRD is Microsoft Access (MDB / “Jet Engine”) based. I suppose it would be possible to make a script to have the HRD Access and CQRLog MySQL databases synchronize, but it would be a lot of work. An easier (though manual) solution would be to synchronize the two by exporting ADIF files from one and import into the other. i have HRD updating mysql but CQRlog uses different values ,yep a script would be ok to do it manually .But id like to make it automatic :-) .I think if CQRlog source code is available maybe changing the values will be the only way ?